It is an adhesive, not caulk, pure and simple. I have lost count of the number of otherwise wonderful woodies who arrive at the shop presenting curtains of old 3M5200 – stalactites – hanging from the bottom plank seams. 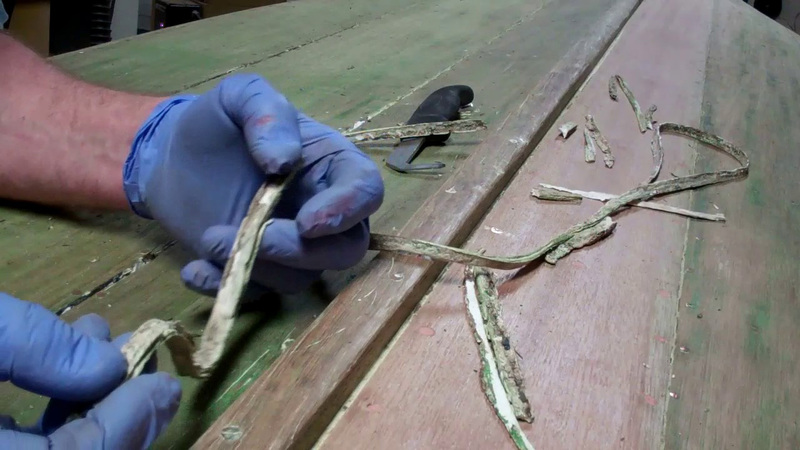 Once cured, 3M5200 will not compress when wetted planks try to expand. The result? Here is stark evidence of what happens next. The planks buckle and split, as several of them have in the ’42 Imperial Sportsman. I have begun cleaning the seams using a curved pick and a reefing hook, supported by utterances that are for other than polite company. OK, what will we use in its place? I am opening seams that are up to 3/16” wide, which is at the outer limit of what it can bridge effectively, but we will use Interlux Seam Sealer for below-waterline applications. It cures, holds paint, and makes a watertight seal, but, even when cured, it never becomes hard. It compresses as the planks expand and expands if/when the planks shrink. After applying the CPES and one coat of Interlux 2000E barrier coat primer, we will work up to three coats into the seams until they are almost fair with the planks. The wider seams may require more. Previous PostPrevious 1959 Chris Craft Sportsman Porcupined!